For seniors, moving can be anything from a long-planned but complicated downsizing to a move to assisted living for a more supportive environment. These moves may entail some one-time decisions and need a little extra planning and help. If you’re downsizing for the first time or have done it already, you know that deciding what to take can be tricky. Start with your new floor plan and decide what furniture will fit best. Visualize your daily life and decide what pieces you use most, which you like the most and then which ones fit the size, shape and style of the new home. Now label the ones you are not taking with a removable sticker or Post It. As the move draws near, you can send these unneeded pieces for sale to a consignment store, give them to Goodwill or pass them along to the kids who might just be able to make good use of them and will appreciate the memories. Now that the “big” furniture decisions are made, the rest of your things have to be dealt with too. Life can be a lot simpler without clutter, so downsizing can be a great opportunity to free yourself from things you don’t need anymore. If there’s just too much to do, spread it out over time or consider getting help to clear it out. Maybe the family would like to go through the old toy chest or the extensive collection of dinnerware? Consider donating and giving away things that you won’t need any longer, or hold a garage sale for extra cash. When you’ve identified the things you will move to your new home, set them aside to be securely packed and labeled for the move. With fewer things you’ll save money on your move, and you’ll be happy when the unpacking is a lot simpler on the other end. Pack your things well so that they are protected. Pack boxes as fully as possible so that you don’t end up paying to move lots of half-empty boxes. Bottled water and light snacks. Lifting heavy boxes is physically strenuous, and there’s no need to be embarrassed if you need a hand. The Nevada heat can be tough, so don’t overdo it if you’re moving in the warm months. Ask friends or loved ones for assistance if possible. If not, ask your moving company to do the heavy lifting for you. Using a moving company is a great way to save yourself time and avoid doing the heavy lifting yourself. In order to make sure you get the service you expect, make sure to check reviews and ask for references before selecting your moving company. Be sure that you receive a written estimate in advance. The moving company should inspect your property in person and then write up an estimate based on how much you will be moving. Any mover who does not give you a written estimate is probably one you don’t want to use. A written estimate gives you peace of mind because it means you know what services you will be getting and how much you will pay for them. Movers usually work by the hour, so to save money, have as much as you can well-packed and ready to go near the front door on move day. Here are some more money-saving move tips. Check your homeowner’s or renter’s insurance policy to see what is covered during your move. You can purchase inexpensive supplemental insurance to protect your belongings during transport if they are not otherwise covered. A good place to start is to ask your regular insurance agent for help. Cancel your newspaper, have your mail forwarded, and notify your banks, social security, service providers and loved ones of your new address. 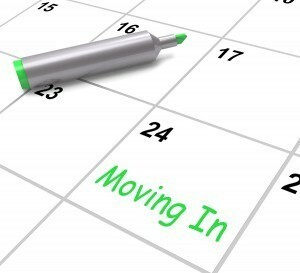 If you are moving long distance, be sure you have contact information ahead of time that you will need on arrival such as utilities, DMV, pharmacy, doctors, and so on. And it’s always a good idea to leave a quick note to the future resident of your old home, letting them know where to forward mail that gets through by mistake or for other things that may come up. If you have especially valuable items that you are afraid of losing, take care of them beforehand. If you decide to take care of them yourself, it’s best to carry jewelry with you during the move so it won’t be misplaced. But to be sure and to make move day easier on yourself, give them to a loved one ahead of time for safekeeping, or store them in a deposit box or, for larger items, put them into a storage unit. Move 4 Less offers short term and long term storage. Ask your moved manager how you can use it to simplify your move. Seniors sometimes need a bit of extra help with the move process. The National Association of Senior Move Managers provides move professionals trained to work with seniors to help deal with all the decisions and activities involved with a move. Especially helpful for seniors on their own, these professionals can help you look out for your interests and make sure no important details are forgotten. With a bit of extra planning and care, your move can be a pleasant experience, and before you know it you’ll be all set up and back to normal in your new living space. Move 4 Less specializes in helping seniors move and we’d be pleased to help you with your next move.